On 7 June 1942, the Japanese Northern Army landed, unopposed, on Attu Island. The island of Kiska had been invaded the day before. 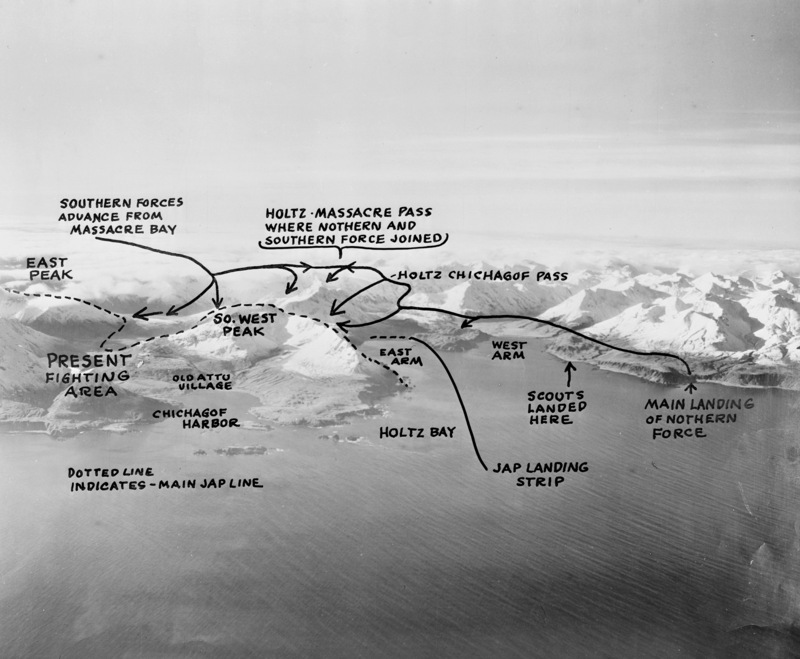 Allied command for the Aleutian Campaign spent the better part of the next year preparing to repel the Japanese from the Aleutian Islands. On the morning of 11 May 1943, visibility off the coast of Attu was estimated at a “ship’s length”, due to the heavy fog blanketing the island. The 7th Division’s Northern Force was to land at Beach Red, a few miles north of Holtz Bay. Beach Red was a narrow strip, maybe 100 yards long, and surrounded by 250′ walls of rock. The Japanese had no defenses nearby, because they never considered it a viable landing point. Captain William Willoughby had 244 men in his Scout Battalion. They came up to Attu in two submarines: the Narwhal and Nautilus. They shoved off in their rubber boats with 1-1/2 days rations, landing at Beach Scarlet in Austin Cove. The air temperature was 27 degrees. The 7th Division’s Southern Force was the largest of “Operation Landcrab”. They landed at Massacre Bay All three landings were unopposed. The beach heads were secure and all forces had made gains, but they were now stalled. The Americans could not see the Japanese up in the fog, but the Japanese could see down out of it. The following day, men and equipment streamed onto the beaches. The Navy ships bombarded the ridges. The Battleship Nevada unloaded her 14″ guns onto the mountain tops above Massacre Valley. The Japanese positions were heavily entrenched, the progress for the Allied forces was slow. The Arctic conditions were brutal, and exposure-related injuries common. Travel over the island was through mud, snow, ice and the unforgiving muskeg. After two weeks of endless fighting, the Japanese were finally pushed up against Chichagof Harbor. With no hope of victory, and little hope of rescue, Colonel Yasuyo Yamasaki led his Japanese troops in one final banzai charge. The Japanese broke through the front lines, and rear echelon troops suddenly found themselves in hand to hand combat with the Japanese. The Japanese charged Engineer Hill in an attempt to gain control of the big guns set up there. The 50th Engineers held their ground, however, and the charge failed. Almost all of the Japanese in the charge were killed, many by suicide by grenade after the charge failed. The failure of the banzai charge effectively ended the Battle for Attu. 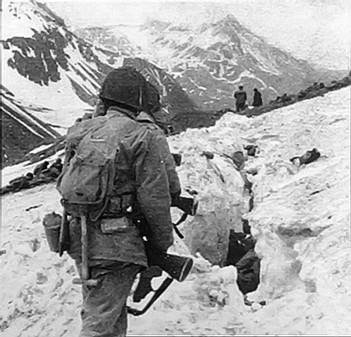 Officially, the Battle of Attu ended on 30 May 1943, but isolated Japanese troops continued to fight until early July. 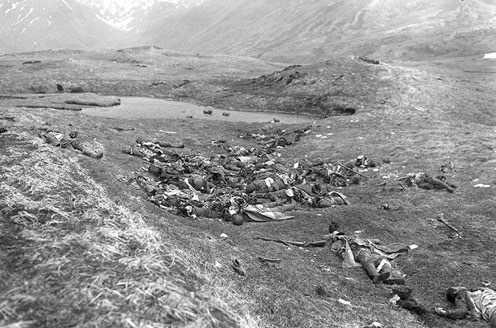 549 men of the U.S. 7th Division were killed on Attu, 1148 wounded, and over 1200 suffered severe cold weather related injuries, 614 disease, 318 other casualties: accidents, drowning, self-inflicted. The Japanese lost over 2350 men. Only 28 were taken prisoner. 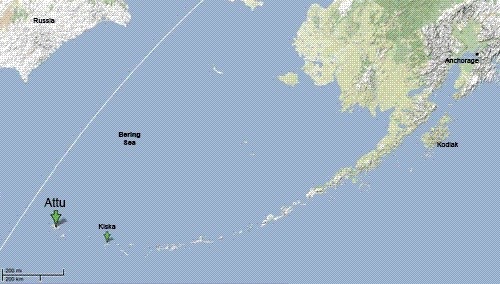 The Battle of Attu was the only battle of World War Two to have taken place on U.S. territory. It was also the only battle between the U.S. and Japan to have taken place in Arctic conditions. The Japanese had assembled a massive fleet in Tokyo Bay to repel the Americans from retaking Attu. The fleet had 4 carriers, 3 battleships, 7 cruisers and 11 destroyers. 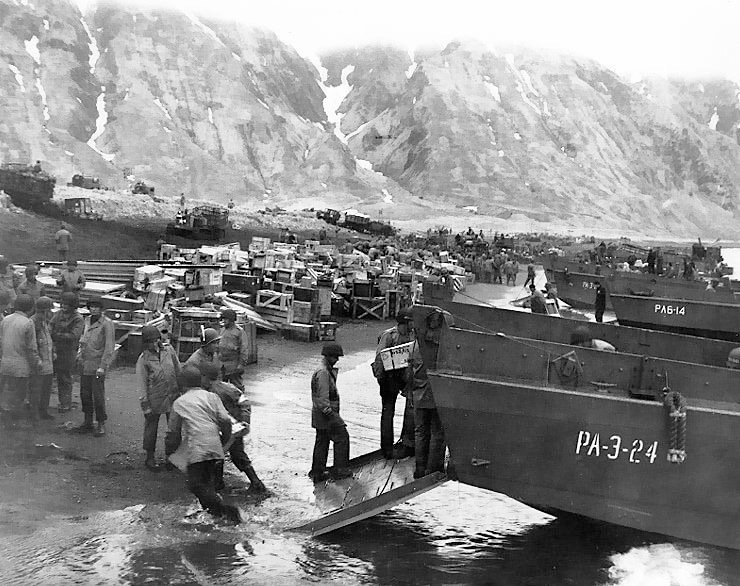 The Allies captured Attu before the fleet could leave the bay. This entry was posted on Friday, May 11th, 2018 at 8:47 AM	and tagged with Alaska, Aleutians, anniversary, attu, cold, ice, photo, snow, WWII and posted in history. You can follow any responses to this entry through the RSS 2.0 feed.